Sweet Autumn Clematis is a climber that can tower 30 feet high or so, sweet autumn clematis makes a strong statement when it blooms in the autumn landscape. This twining vine’s flowers are white, numerous and fragrant. 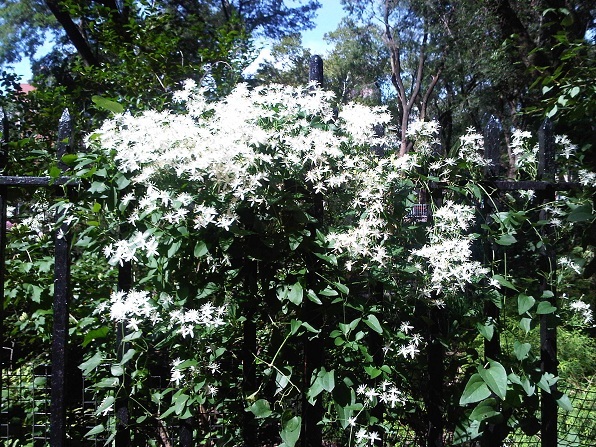 When covering wood fences or similar structures, a sweet autumn clematis in bloom gives the appearance of a great fleece. Bloom time is late summer to early fall, when many other perennials are done blooming for the year. This year for the first time, this Clematis bloomed gloriously.